The Presidential Citation is chosen annually by the sitting PPAG President/Chair of the Board and awarded to an individual that has made a significant and direct impact on the Pediatric Pharmacy Advocacy Group. Sherry Luedtke, PharmD, Professor of Pharmacy at Texas Tech University, for her leadership during transitional challenges during her service on the Board of Directors. This award was presented by Dr. Robert Kuhn, 2006 Chair of the Board. Stephanie Phelps, PharmD, Professor of Clinical Pharmacy at The University of Tennessee, for her sustained contributions at the Editor of the Journal of Pediatric Pharmacology and Therapeutics. This award was presented by Dr. Cindy Dusik, 2008 Chair of the Board. David Knoppert, MSc.Pharm, Neonatal Pharmacist, St. Joseph's Healthcare, London, Ontario, Canada, for his outstanding service as Chair of the First International Pediatric Pharmacy/Pharmacology Symposium. This award was presented by Dr. Jeff Low, 2009 Chair of the Board. ​Miranda Nelson, PharmD, Assistant Professor at Southern Illinois University Edwardsville, for her sustained contributions as Chair of the Home-Study Education Committee. This award was presented by Dr. Michael Christensen 2010-12 Chair of the Board. Lisa Lubsch Bimpasis, PharmD, Clinical Assistant Professor at the Southern Illinois University Edwardsville School of Pharmacy, for her efforts preparing and developing the first Board Exam Preparation Course for PPAG to be conducted in the Spring of 2015. 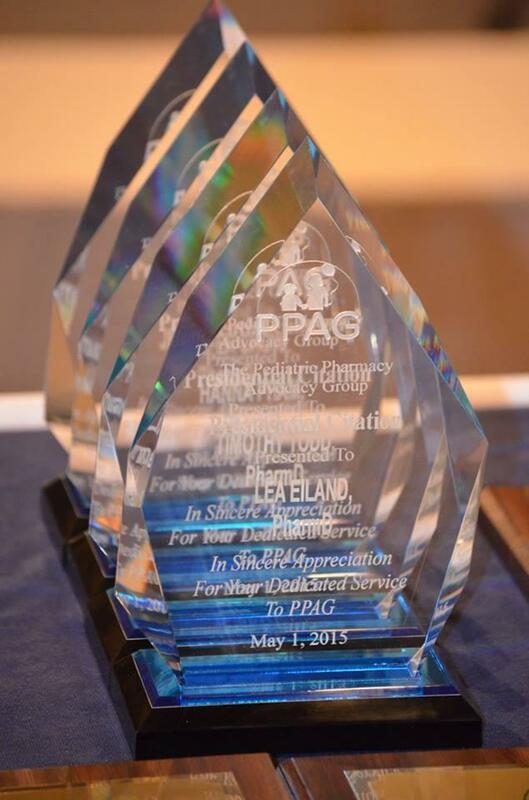 This award was presented by Dr. William Maish, 2013-14 PPAG President. Hanna Phan, PharmD, BCPS, Assistant Professor in the Colleges of Pharmacy and Medicine at The University of Arizona, for her efforts to develop a BCPPS Recertification Program for PPAG. Timothy Todd, PharmD, Associate Professor in the College of Pharmacy at Midwestern University, for his efforts to develop a BCPPS Recertification Program for PPAG and co-edit the Advanced Pediatric Therapeutics textbook. Lea Eiland, PharmD, Associate Professor in the College of Pharmacy at Auburn University, for her efforts as co-editor of the Advanced Pediatric Therapeutics textbook. Jennifer, Chow, PharmD, PPAG Director of Professional Development, for her efforts to organize the first BCPPS Exam Review Course. These awards were presented by Kay Kyllonen, 2014-15 PPAG President. ​Edress Darsey, PharmD, Global Pediatric Medical Director Pfizer Pediatric Center of Excellence​, for her efforts to advance PPAG's goals to partner with other pediatric related organizations. ​Kristen Nichols, PharmD, Assistant Professor at Butler University, for her work developing the Membership-in-Training Committee, which supports the PPAG Student Council, College Groups, student educational activities at the Annual Meeting. ​Tara Higgins, PharmD, a Pharmacist at UF Health Shands Children's Hospital, for her leadership to the Fall Meeting Planning Committee, Hematology/Oncology Special Interest Group, and Membership Committee. Rachel Meyers, PharmD, Clinical Association Professor at Ernest Mario School of Pharmacy at Rutgers, for her efforts to advance PPAG advocacy efforts. Kathy Pham, PharmD for her efforts to advance PPAG advocacy efforts.